AP DME Assistant Professors Recruitment 2018, Apply Online at http://dme.apntruhs.in/: AP Medical Education Services has issued the 280 Assistant Professor Posts recruitment notification and online applications are invited from the eligible and interested candidates for filling the Assistant Professors in DME AP and last date to submission of online applications is 15.11.2018. 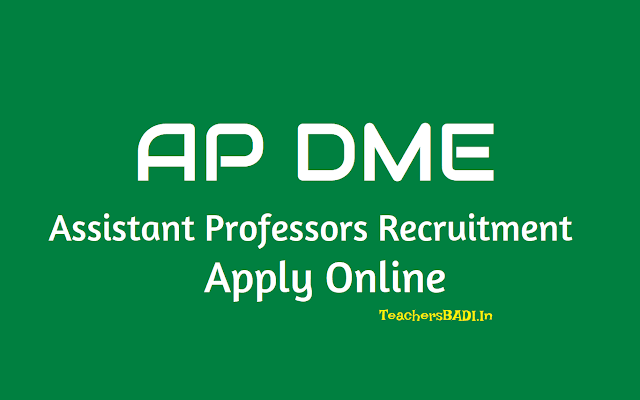 So, AP Medical Education Services invites applications for the direct recruitment of Asst. Professor Posts. 2. Department: Anatomy, Physiology, Biochemistry, Pharmacology, Pathology, Microbiology. 3. Qualification: MBBS, MD, MS, MDS, DM, M.Ch, DNB, M.Sc, MDS, D.Sc, Ph.D. with experience. 4. Local Candidate: Candidates who belong to Andhra Pradesh only need to apply. 5. Age: Age should be less than 42 years as on 01.10.2018. 6. Selection Process: Marks obtained in qualifying PG degree/ super speciality Examination, Weightage for No. of years since passing qualifying examination, Weightage for Contract service in Govt. Institutions. 8. Online Applications from: 31.10.2018 to 15.11.2018. MD. (Pharmacology) / MBBS with M.Sc. (MedicalPharmacology) / M.Sc (Med. Pharmacology) with Ph.D (Med.Pharmacology) / M.Sc (Med. Pharmacology ) with D.Sc (Med.Pharacology). MD / MS/ MDS / DM / M.Ch / DNB in the concerned specialty recognized by MCI. 1. OC candidate :- Age should be less than 42 years as on 01-10 -2018 (should not have been born before 01-10-1976). 2. SC/ST/BC candidates :- Age should be less than 47 years as on 01 -10 -2018 (should not have been born before 01-10-1971). 3. Ex-service men :- Age should be less than 50 years as on 01.10.2018 (should not have born before 01-10-1968). 1. All Clinical speciality candidates should have completed one year senior residency in concerned speciality in the medical colleges recognised by the MCI. 2. The DNB candidates who have completed the course in an institute recognised by the MCI require one year senior residency in a medical college. The DNB candidates from institutes not recognised by 3. MCI needs to complete 3 years junior residency in addition to one year senior residency after processing DNB. 4. The Senior residency should have been completed before 40 years of age. Assistant Professors PAY SCALE: Rs. 15600 - 39100 and Academic Gr. Pay of Rs. 7000/- and other allowances as admissible under the rules in force from time to time. i) 75 % for Marks obtained in qualifying PG degree / super speciality Examination. ii) Weightage for No. of years since passing qualifying examination is up to 10 marks @1 mark per PG / Super-specialty completed year. b) 2 marks per six months in Rural Area. c) 1 mark per six months in Urban Area. iv) There will be no Interview marks. v) Weightage of contract service will not be counted for those candidates who have already benefited once in getting Govt. service. 2. The decision of the selection committee as per G.O. Ms. No. 109, HM & FW (A2) Dept., Dt. 23.6.2014 and G.O. Ms. No. 154, HM & FW (Al) Dept., Dt. 4.5.2002 in all aspects and all respects pertaining to application and its acceptance or rejection as the case may be, the selection or otherwise of any candidate shall be final in all respects and binding on all concerned. 3. The selection committee also reserves its rights to alter or modify regarding conditions laid down in the notification for selection and also posts notified. 1. OC,&BC candidates :- have to pay Rs. 1500/- through online payment gate way and obtain the printout of filled in application copy. I. S.S.C. certificate (proof of date of birth). II. Study certificate from class IV to X and Intermediate. (Proof of local candidates). III. Marks lists of Post graduation (MD / MS / Mch / DM / DNB / MDS / M.Sc). 4. Others M.Sc / Ph.D /M.D.S/ D.Sc Degree Certificates. V. Registration of PG / Super-specialty / DNB degree with A.P. Medical Council. VI. Service certificate (contract) - Doctors who are working on contract service with Govt. should produce service certificate. VII. Service Certificate (in service) Doctors who are working as Civil Asst. Surgeons in Govt. service should apply through proper channel only.